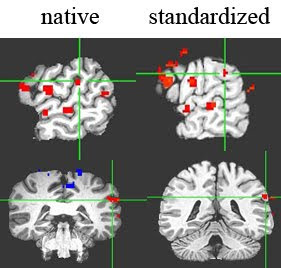 It is a standard practice in functional brain imaging studies to spatially "normalize" one's data to a common space such as Talairach space or MNI space. The reason for doing this is to allow data from multiple subjects to be averaged. (Here is a discussion of this process.) It is acknowledged that there is error in the process due to variation from one brain to the next. Yet at the same time the (also standard) practice of overlaying warped and group-averaged brain activations on a single high resolution structural MRI temps investigators and readers alike to interpret the location of the blob of activations very literally. More than once I have heard comments about this or that activation being on the upper or lower bank of a sulcus, for example. We simply don't have the spatial resolution to tell in this sort of fMRI analysis. Although orthogonal to the main conclusions of the study, I suggested the "real" location may be inside the Sylvian fissure, and may reflect activity of a sensory-motor integration area, Spt (Hickok et al. 2009). The reason for this speculation is that we have found that simply normalizing a single subject's functional imaging data can cause the activation focus to jump from within the Sylvian fissure to above it, falling on the SMG. The figure below shows activations in native space (left side sagittal and coronal images), that is, non-normalized and on the subject's own MRI (also non-normalized) and after warping to a standard space (right side sagittal and coronal images). The activation of interest is in the crosshairs. Notice that in native space the focus of activation is within the Sylvian fissure and after standardization it moves up above and is on the SMG. This happened consistently enough across subjects in two independent datasets that the group focus ended up in the SMG despite individual subjects showing activation in the Sylvian fissure. This bit of spatial error may not seem like much of a problem, but it is. This jump crosses cytoarchitectonic boundaries and could lead to dramatically different functional interpretations based on what is known about these areas. So what do we do? If location matters, you can confirm your activations in native space in individual subjects, or you can try normalizing with sulcal based co-registration schemes rather than the standard methods. Interesting post. Thanks also for highlighting my paper. I'm reposting here a version of the comment that I put on the end of the previous thread, because I guess it belongs more in this one. The main focus of that paper is on what type of information processing is taking place, rather than where it is located. What's interesting to me about the ROI is the way it seems to be specifically amplifying stimulus-differences that cross the category boundary. It's not really crucial which side of the fissure it's on, although that is fun to wonder about. In the paper, the plots of the behavioural and neurometric curves take up a lot more space than the brain-slice activation plots. That reflects their importance relative to each other, for me at least. Right, my comments about the localization issue in no way detract from the conclusions of your paper. To make sure I didn't imply that, I slightly edited my post to indicate that this is an orthogonal issue to what your paper is claiming. Thanks for your comment! This issue, and particularly with respect to the auditory domain was hammered out pretty well by Desai et al., which I think is a pretty good manifest for why language researchers should use surface based registration. Desai R, Liebenthal E, Possing ET, Waldron E, Binder JR (2005). Volumetric vs. surface-based intersubject alignment for localization of auditory cortex activation. NeuroImage 26(4), 1019-1029. Jonas, we actually confirm our activation localizations in individual subjects, so I am confident about the location of Spt. Tahmasebi AM, Abolmaesumi P, Zheng ZZ, Munhall KG, Johnsrude IS. 2009. Reducing inter-subject anatomical variation: effect of normalization method on sensitivity of functional magnetic resonance imaging data analysis in auditory cortex and the superior temporal region. Neuroimage. 47:1522-31.